And rest in peace, Danny Federici. It won't be the same without you. 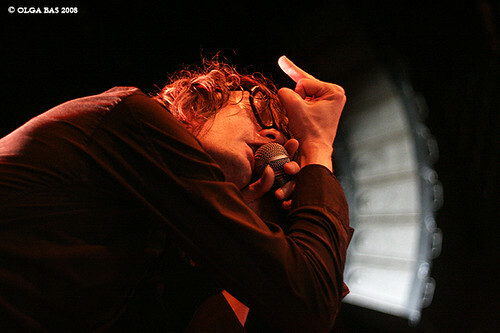 Jarvis Cocker put on one hell of a show last night at Brooklyn's Music Hall of Williamsburg. Bill has a more detailed write-up over on Sound Bites, but I need to take a second to tell you how awesome this show was. The big music war in 1990s England was between Blur and Oasis, but I'll take Pulp over either of them every time. For me, they're one of the defining bands of the decade - I'm pretty sure albums like Different Class will still sound fresh twenty years from now. Cocker has moved past his Pulp days, and as much as I love that music, I didn't miss it at all last night. Nobody did, in fact, and it's worth stressing that not one person yelled out a request for their stuff. The set list was a pretty even mix of material from Cocker's solo debut, Jarvis, and new material, of which "Girls Like It Too" was a definite highlight. Main-set closer "Black Magic" just about leveled the room, and I'm not sure "Common People" would have gotten a better reaction from the 550 fans lucky enough to score tickets. If you can get into tonight's Terminal 5 show, make it happen. My friend (and fellow U-92 alum) Bill Pearis knows as much about music as anyone you or I have ever met. He covers new music and NYC shows on his blog, Sound Bites, and he also writes a column for the hugely popular Brooklyn Vegan, which is both a blog and a person. Bill just started a new feature today called Summer Fridays - he's posting a new downloadable mix every week, complete with cover art and fancy segues. The first mix is fantastic, and not just because it features XTC's "Life Begins at the Hop." Don't miss it. Also, I skipped out of work early yesterday so I could go to Midtown Comics and meet Brian K. Vaughan, who was doing a rare signing (I think it's actually his last for 2008). Vaughan is probably best known for his series Y: The Last Man, about a sudden, catastrophic event that kills every male on Earth but one guy and his pet monkey. He's also a writer and executive story editor for Lost, and I'm not alone in believing the show improved tremendously as soon as he was brought in, late in season three. Other notable works include Runaways, Ex Machina, Pride of Baghdad, and a recent arc about Faith for Buffy the Vampire Slayer Season 8. Vaughan is only going to get more popular and successful - he's on my short list of People Who Will Rule the World - so keep an eye out (and pick up the first trade collection of Y, "Unmanned", while you're at it). I'm still playing Grand Theft Auto IV, and as usual, I'm spending a lot of time just driving around and listening to the in-game radio (there nineteen stations in all - sixteen music and three talk-radio). Jazz station JNR is particularly strong, with tracks from John Coltrane, Miles Davis, Chet Baker, Sonny Rollins, and a few more. As a former jazz DJ, that makes me happy, although they could have used a few more songs - some Mingus or Lee Morgan or Jimmy Smith, or maybe Miles' A Tribute to Jack Johnson in its entirety. Anyway, these are the tracks that I really get excited about, to the point that if they're playing, I'll usually sit in my fake car, double-parked outside a fake building, until they're over. It's like being sixteen again, only with a sniper rifle!